Every day, you text, chat online and connect with loved ones. You explore, and connect with your passions, your inspirations, and exciting new experiences. Lyra Trio connects you to more possibilities, while protecting your privacy along the way. Always stay connected to the people and things that matter most to you, with fast, simple and secure WiFi in every corner of your home. Covers Multi-Story Homes up to 5400 sq. ft. Whether you're in the basement, the garden or the living room, you want all your WiFi devices to work smoothly. 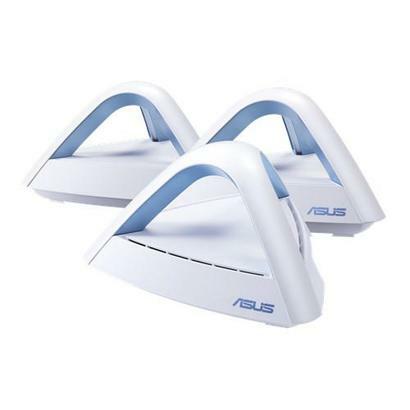 The ASUS Lyra Trio mesh WiFi system uses multiple wirelessly connected hubs to deliver a superfast, reliable and secure signal to every corner of your home. The multiple hubs of Lyra Trio work together to form a single network with one WiFi name. Once you're on the network, Lyra Trio automatically connects you to the hub with the best signal and seamlessly switches hubs as you move around your home. It's so smooth, you won't even notice it — even if you're video chatting or streaming video. Lyra Trio has a 3x3 MIMO antenna design that provides an additional spatial stream compared to 2x2 mesh WiFi systems, meaning it can handle more simultaneous network traffic for fast, reliable performance even when many devices are connected to the network. The individual Lyra Trio hubs also connect to each other using three lanes, maximizing data speeds as data hops from hub to hub, ensuring you get the best WiFi performance in every corner of your home. 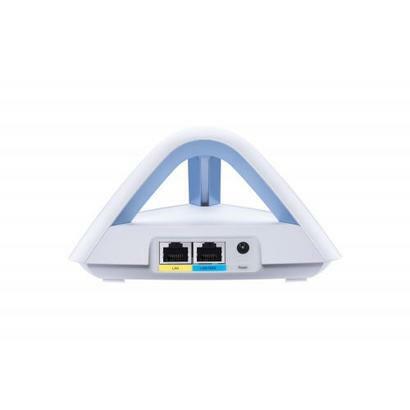 Lyra Trio has a unique pyramid antenna design that minimizes interference and transmits the WiFi signal vertically as well as horizontally for better reception and performance in multi-story homes. Every day, you rely on connected devices to manage and access your personal data, but you may not know if your privacy has been secretly compromised. The advanced cloud-based security powered by Trend Micro™ built in to Lyra Trio makes sure your privacy is always protected on all connected devices, even smart home (IoT) appliances. Lyra Trio supports Ethernet backhaul, which means you can use network cables to connect multiple hubs together. If you have on-wall Ethernet ports in different rooms of your home, this feature lets your routers communicate with one another over a wired connection, making your WiFi system even more stable and reliable. It also reserves the entire 2.4GHz and 5GHz band for your wireless devices, letting you enjoy smoother and faster connections. How Many Lyra Trio Hub Do I Need? Lyra Trio uses multiple hubs to make it supremely flexible for any environment: no matter what size or shape your home is, Lyra Trio gives you all the coverage you need!